LANSING – Michigan Gov. Gretchen Whitmer on Thursday ordered state agencies to halt action on a proposed tunnel to encase the controversial Line 5 pipeline in a tunnel. Whitmer’s executive directive came minutes after a fellow Democrat, Attorney General Dana Nessel, issued a legal opinion claiming that a law creating a state authority to oversee construction of the tunnel is unconstitutional. Nessel’s opinion was her first since taking office Jan. 1, and it came in response to a request from Whitmer to review the law. Last year, both campaigned on shutting down the 66-year-old oil pipeline, and they opposed compromises including a tunnel. The move puts Whitmer and Nessel on a collision course with Republicans that could likely end up in court. "An AG opinion is exactly that, an opinion. It’s not binding. It's not final. And it's certainly not without cause to challenge," said Senate Majority Leaker Mike Shirkey, R-Clarklake. "The Senate will pursue its options in order to advance the very important work and purpose of the energy tunnel. This is the fastest, safest, and most economical long-term solution for Michigan. It’s very important to our economy." House Speaker Lee Chatfield, R-Levering, called the tunnel plan "the right thing to do for our state, our waterways, and for our future." "It is well past time to put aside political talking points and campaign rhetoric and just do the right thing. This administration needs to protect the people of our state, secure our critical Mackinac Straits and approve the tunnel project immediately," he said in a statement. Whitmer's move was cheered by environmental groups, who have repeatedly said a leak in the line could create havoc on the Great Lakes. “Governor Whitmer’s leadership today ... should be immediately followed by implementing a process to decommission Line 5,” Anne Woiwode, chair of the Sierra Club Michigan Chapter, said in a statement. “Every day these oil pipelines remain in the Mackinac Straits is a day when Michigan’s future can be drowned in a sea of oil,” she added. For its part, Enbridge said it was "surprised and disappointed" and wants Whitmer to clarify the path forward. Nessel's opinion kickstarted a new chapter in the short, but complicated history of Enbridge’s plans to encase Line 5 in a $350 million to $500 million tunnel below 100 feet of bedrock. During his final weeks in office in December, Gov. Rick Snyder signed Public Act 359 to create the Mackinac Straits Corridor Authority to oversee construction and operation of the tunnel. The Republican immediately made appointments to the authority’s three-member board, which approved a series of tunnel related agreements with Enbridge. Republicans, Enbridge and other supporters have called a tunnel the best way to protect the Straits while keeping energy flowing to the Upper Peninsula. The legislation’s passage, the board’s creation and its signed agreement with Enbridge came in a matter of days, leading to complaints from Democrats and environmentalists that language in the law and was poorly vetted, if lawmakers had any time to read it. Initially, Snyder’s plan hinged on the Mackinac Bridge Authority, an independent state agency that oversees the iconic bridge, owning the 4-mile, 12-foot in diameter tunnel and leasing space to Enbridge for 99 years. That prompted fierce opposition, including from former bridge authority members who worried it would distract from oversight of Mackinac Bridge. Rather than scrapping the original bill, Republicans — to save time during the fast-moving lame duck session — re-wrote it, keeping the Mackinac Bridge Authority in the bill's title as a body authorized to acquire the new “utility tunnel." The bill was written so that the Mackinac Bridge Authority would immediately transfer all of its initial powers over the tunnel — including acquisition construction and operation —to the newly created corridor authority board. The far-reaching power transfer to the corridor authority board "comes without fair notice and is a surprise" to lawmakers, Nessel wrote, because it is not mentioned in the bill's title. “Michigan law is clear that where the body of an act exceeds the general scope of what is expressed in the title, the offending provisions violate” the Constitution, Nessel wrote. Her opinion came two weeks after Michigan Court of Claims Judge Stephen L. Borrello found another part of the corridor authority law unconstitutional. The law granted six-year terms to the board’s members, even though the constitution bars terms greater than four years. That ruling came in a lawsuit filed by a nonprofit called A Felon's Crusade for Equality, Honesty and Truth. The term-limit issue was the only challenge in that lawsuit, and Borrello wrote that the corridor could continue to operate. In her review, Nessel wrote that courts would likely see the separate “title-object” violation as too large to keep the corridor authority intact. “It cannot be concluded” that lawmakers would have passed the law had they known of the constitutional violations, she wrote. So what did this 'opinion' actually do? Answer: Delayed the completion of a tunnel which is a win-win for everyone. Politics wins out over smart risk management. Better to keep the issue in the headlines and extend the time when the Great Lakes is exposed to the risks that politicians have been promoting to be in the media darlings. This is a reason why people don't believe politicians can accomplish anything and there will be any political collaborations to fix Michigan problems and improve our environment. And maybe increased the amount time that the lakes are at theoretical risk for this theoretical pipeline leak? in its comments of august 2017 on the dynamic risk draft report, enbridge filed a technical paper noting the temp jobs created by the tunnel would be primarily from an outstate contractor with its own skilled employees. UP propane deliveries from line 5 amount to 2-3 propane truckloads a day. the same dynamic risk report said that shutting down line 5 would mean a temp price jump of about a nickel a gallon until a new supplier filled the gap. read the studies by gary street at the FLOW website and the study by London Economics International at NWF site. better yet get Enbridge to disclose the actual volume of propane delivered from rapid river. good luck with that. rail line exists from superior, wisconsin to within a mile of rapid river. volume used from rapid river is one rail car a day. dynamic risk study paid for by enbridge said closure of line 5 would cause a temp increase of less than a nickel a gallon in propane costs. costs increases in 2013 were due not just to mechanical issues in rapid river but general shortgage of propane in the midwest. Again, studies funded by FLOW and NWF are not 'independent'. You say Enbridge won't admit how much is delivered to Rapid River? I have seen Enbridge consistently say 65% of the propane used in the UP. That is certainly more than 'one rail car a day'. A rail car typically holds about 700 barrels of crude oil, so I would say similar in natural gas liquids. As I mentioned, if you have ever driven by the Rapid River facility and seen the trucks lined up waiting to get in to load, it is certainly over 'one rail car a day'. Please rebuke the claims from the large propane dealers in the UP in a Marquette Mining Journal article last fall on how important Rapid River is to their supply and reliability to get us our propane. You also assume that the facility you reference in Superior, WI has the capacity to extract additional propane from the pipeline there and then rail it to Rapid River? Are you certain that capacity exists and if so, please let me know your research results. You consistently minimize one benefit of the pipeline and ignore the others like; MI produced crude oil to market, over 100,000barrels/day delivered to Michigan and Ohio refineries, propane from Sarnia that comes back to eastern MI, regional balance for petroleum feed stock, plus indirect benefits like significant county by county tax contributions, jobs, employment, etc. Add them all up and it is easy to see the benefits the pipeline has provided for 65 years to Michigan. Hang out at your local gas station or propane dealer and see if the stuff isn't needed. Michigan doesn’t recieve any of the oil / gasoline that line 5 carries and is taking all the risks for a measely 20 jobs that aren’t guaranteed to be hired in state. Think about all the 1000s of people who would lose their existing jobs were there to be spill in the straits. Tourism would halt for years, the billion dollar blue economy would never be the same. If you care about Michigan economy and jobs, you should be against line 5. Propane can stay, oils gotta go. You are absolutely wrong on oil/gasoline that line 5 carries. Near Lewiston it takes in most of the northern MI produced oil. In addition, Line 5 delivers oil in St. Clair County which is then shipped to Michigan's only refinery (Marathon near Detroit) and also the two refineries in Toledo, OH. In addition, a lot of propane refined in Sarnia from the 'end' of Line 5 is piped back into Michigan for use. Please cite your reference that Line 5 only provides for 20 jobs? And you are mostly right about a spill in the Straits being devastating even though the likelihood is extremely small. I could die during my next plane trip, but I choose to fly despite the small risk. That's why a tunnel is the right way to go as it eliminates the risk of a spill into the Straits. Tunnels not lawsuits! it is rather simple. this is canadian oil going to sarnia for the canadian market and export. only 5% goes to the detroit marathon refinery. it is not vital in any way to michigan. pipelines may be the best way to move oil. but a pipeline in the great lakes is an almost criminal act of stupidity. available in the State of Michigan. " In the lameduck session, mich repubs rejected a dem amendment for a 50% guarantee of mich temp jobs. final bill approved "a plan" for a pool of temp jobs. You conveniently don't mention that in addition to Marathon that some Line 5 oil goes to the two refineries in Ohio which obviously feed back product into Michigan. Michigan consumes over2.5 times the amount of oil than it's one refinery (Marathon) produces. This product comes back from refineries in OH. If Line 5 supply to Sarnia was shut down as you suggest, where would the Sarnia refineries get their oil from? Answer: from the current sources that other MI and Midwest refineries do. What does this mean for the public? Answer: Increased competition for the same barrels of oil which means more cost for us at the pump. Put that on top of the proposed gas tax and lower income households suffer the most. If this shut down happens, this will essentially shut down MI produced oil from our local neighbors who produce MI oil and Line 5 brings to market. Michigan labor will gain much work from this project and they are stating this strongly in their public support for this tunnel. Please ask them, don't speak for them! Drilling for oil and natural gas is taking place all over in southern Michigan. In fact a rather large underground pipeline has been under construction for a few years through several counties connecting all the newly installed wells. I see several of these sights every day on my 50 minute drive to work each day. In light of this I find it hard to believe shutting down this pipeline will present financial hardship for Michigan residents. I could be wrong, not sure how it might affect da yoopers. 95% of the 23 million gallons of crude going daily thru the straits is delivered to sarnia. dynamic risk report of 2017 paid for by Enbridge reports that line 5 closure would increase gasoline prices in michigan by 1-2 cents per gallons. let's put the issue on the ballot - constitutional amendment to bann pipelines in the great lakes. I'll let you count the ballots. better yet let enbridge sue the state for violating its 1953 easement. enbridge can pick the jury. Wrong again. You conveniently and consistently don't factually represent what is delivered on the MI side of the border in Port Huron County and goes to refineries in MI and OH. If you believe that for something out of state to be allowed to even pass through Michigan must be vital in some way, can you define vital for the rest of us? We will need this clarification so we can decide whether trucks loaded with parts for other states should be allowed to cross the Bluewater and Ambassador bridges or the Tunnel. I wonder if tourists simply passing through Michigan on their way to Canada are vital, what should be done with a traveler from Toronto on their way Chicago. How does vital apply to the freighters traveling the Great Lakes? I notice you seem rather sure that Michigan doesn't have the skilled people to work on the pipeline tunnel, but that raises the question how do we develop people with those skills if we never allow those skills to be used in Michigan. It would seem if we never allow work [other than vital] to be done in Michigan if we don't have people with the skills to do such work Michigan will we ever have a reason to train people with those required knowledge. Another consideration is what message is being sent, if the answer to ever issue/problem impacting businesses is to shut it down rather than allow the business to present ways to resolve or mitigate the problem/issue. If you doubt that this is a consideration by business, the reality of business is to plan years out and identify the potential costs and benefits. In the case of the pipeline, all of the investment in hundreds of miles of pipeline is lost because the emotions of a relatively small number of people. If those millions can be lost so quickly what could happen to other businesses and their investments? If we want Michigan to succeed and the people in Michigan to succeed we need to allow them to complete, to allow people to have opportunities we don't have now. I offer a different approach to problems/concerns like the pipeline, the PFAS problems/concerns, a virus outbreak, failure of [you pick]. An event emergency response team, a protocol for a chartering a team to identify, to frame, to assess, to propose action plan, to ensure conformance to the plan, etc. The team would be made up of a person knowledgeable in the response team protocol/process, a person knowledgeable in the function/science/operations involved in the event, a person knowledgeable in the local and others as appropriate. The would be the people to make actions happen in a timely manner the protects the people, that prevents a reoccurrence, and allows the people and the politician make the long-term choices, rather then the gridlock and in action the continuing stress that the in action contributes to. If we can't talk about the risks and such associated with the pipeline, let's talk about means/methods to address the immediate needs that such an event as you are fearful of [and the I want prevented] could cause will so the public is better protected. Thank you, Anonymous! I've read elsewhere that the proposed tunnel beneath the lakebed may be ready only after a decade. Patching only after leak detection does nothing to avoid lake contamination over the next ten years of Line 5 operation. I'm not an engineer (or clairvoyant), but believe that over time, progress in energy use efficiencies and transportation evolution can reduce fossil 'fuel' requirements. The house and senate need to rein the governor and attorney general in with these job destroying policy pipe lines are the safest way to transport oil and natural gas than any other mode to transport product. There more pollution running off the Mackinac Bridge after a rain storm than would ever because by a leak in line 5, what next stop great lakes shipping and fuel barges transiting the great lakes more chance of a spill from then line 5 what a bunch of Idiots. Check out the Enbridge caused oil spill in the Kalamazoo River in 2010- cost over 1 Billion to clean up, but I guess that is small change compared to rain run off on the Mackinac Bridge. As I recall Whitmer beat her Chucklehead opponent last November. She ran on a promise to decommission Iine 5 and is attempting to fulfill that promise,. Why Enbridge would be “surprised “ by her action to halt administrative work on the tunnel is beyond my understanding. The era of corporate hand holding is over and is being replaced with hand slapping! Bravo Gretchen-see you at the UofM graduation in May. What dimwits Whitmer and Nessel are. 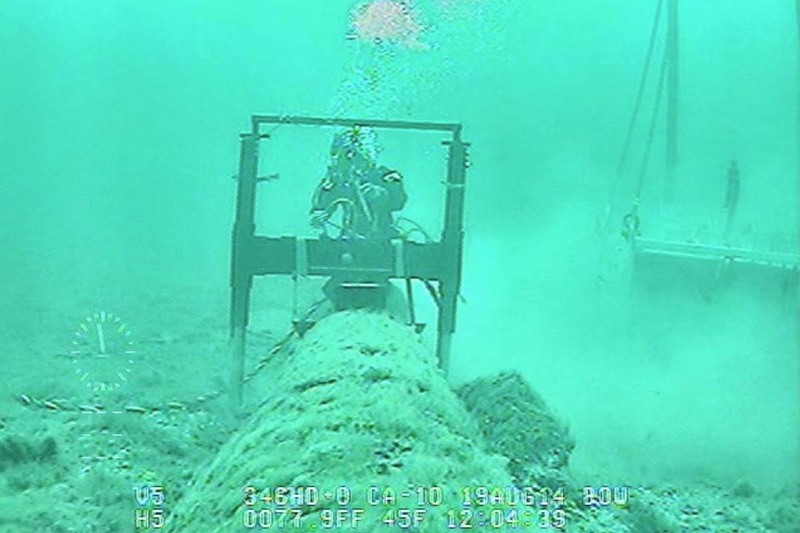 Just look at the picture of the diver trying to do an inspection on a pipe in the water that is susceptible to not only leaks but also ship anchors and anything else that drags the bottom of the lakes. Now picture a dry tunnel located 100' below the lake bed, an inspector walking through the dry tunnel looking for drops of oil on the floor of the tunnel. A pipe within a tunnel will always be less risky than a pipe on the floor of a lake. I say build the tunnel as fast as possible and forget the legal mumbo-jumbo opinions. so you are ok with letting the 66 year old pipelines continue to pump for the decade long tunnel build??? and the next anchor drag can be avoided by ???? 95% of the oil goes to sarnia for canadian market or export. why risk the great lakes for serving as a shortcut for getting canadian oil to market in canada or for export to europe? Don't dignify these claims about protecting the great lakes. We all know this isn't about risks of leaks, ruptures and so on, which they make no effort to even quantify. If risk was a real concern, they'd never get on a air plane or any other activity with an existent risk, let alone fight putting this pipe deep under the surface. It's about doing an around the barn effort to strangle off the petroleum industry so that those doing it can largely hide from the ignorant voters left wondering why it costs so much to fill up their car or heat their homes. And then still be able to blame the greedy oil companies. Very few of these leftists have the courage of their convictions to advocate a substantial gas, carbon or greenhouse gas tax so this is what we get. Look how fast they ran from the Green New Deal vote! The enviro-leftist politicians are all cowards. Given how quickly and secretly the Snyder administration and the House and Senate approved the tunnel for the Line 5 pipeline under the Straits, I always wonder what transpired to make the action so quick, without public comment or scrutiny or even debate in either the House or the Senate. Did big money "but" this potential debacle for the drinking water of millions of people? All of the comments are clearly aligned with the poster political ideology which is to be expected. Science and history with a look at the environment, both past and present, should be what guides us in making decisions about things like pipelines and coal power plants and other threats to our air and water and climate. Will it require difficult and unpopular and expensive decisions to protect what we haven't already destroyed or spoiled in our state and country and around the globe? Is it worth the bother and the cost to save some beauty and an inhabitable world for future generations while we still can? If the answer is yes, fight like crazy to remove Line 5. If it is no, then build a tunnel to buy some time and to make yourselves feel like at least you did something. This is both short sightedness and political agenda driven thinking. Critics of the tunnel do not understand the engineering of it and the significant environmental benefits of the tunnel. There is literally almost zero risk of a leak once the tunnel is in place. Any delays in its construction only increases the potential for a catastrophe. Enbridge does need to step up significantly and completely repair other areas of Line 5 during the engineering and construction phase of the tunnel as well as reducing pumping pressures until the tunnel is completed. As a Michigan resident with a home a few hundred feet from Lake Huron I applaud the attorney general and the governor for their decision. Great lakes are twenty percent of the Earth's fresh water enbridge puts up twenty percent of the Earth's wealth in an unrevocable bond to be split equally by every man, woman, child living in the great lakes region in case of a spill. They are benefitting $ the risk is all on us our life now as we know it. Put up or go away. It is wonderful how people can suddenly discover something of interest and believe it only exists from the moment they thought of it. The pipeline has been in use for over 60 years and yet the Great Lakes have not been harmed from it, this suggest that simply because something might happen, could happen it doesn't have to happen. When they laid the pipeline over 60 years ago they used available technology and it has worked. Now they are planning to improve on that technology and you feel there is no hope. All you can hear are those exploiting a risk for political gain. You simply damn all the science, all the technology, all the people that could prevent your greatest fear from happening. You ignore all the other risks that exist how they are prevented from happening. You seem to want to live a simple life without risk and only to hear what some under informed politicians or reporters or editors wants for what you to think. You and the politicians and reporters and editors aren’t willing to learn why the pipeline hasn't failed, hasn’t had the catastrophic event that is driving all their hysteria, they only are willing to talk about what might, what could happen and how bad it might or could be. You, like them want to demean and belittle the value and use of the science taught in our universities, the learning that those who attend those schools gain, and even knowledge and skills that people in Michigan and elsewhere possess and apply every day. Condemn and dismiss the tunnel and the pipeline, but also recognize how you will grow your ignorance, just as the politicians and reporters and editors do when they avoid making an in-depth analysis of such risks and the means/methods proposed to prevent/mitigate them. For once you stop trying to understand the thoughtful efforts and thinking of others you condemn yourself to fear and it being your constant companion with ignorance being your guide. I apologize for making this sound about you, for it was your comments that made me thing which crystalized for me what has been spread across the pages of Bridge and the political rhetoric on this issue and how it confirms the theme we hear across so many issues we are reading and hearing. And now, 3 weeks later, in the Detroit paper this morning was an article on how Whitmer has signed up to get a new tunnel completed by 2024. I guess the attention to this has disappeared, an Gretch can do whatever she wants without a lot of pushback.